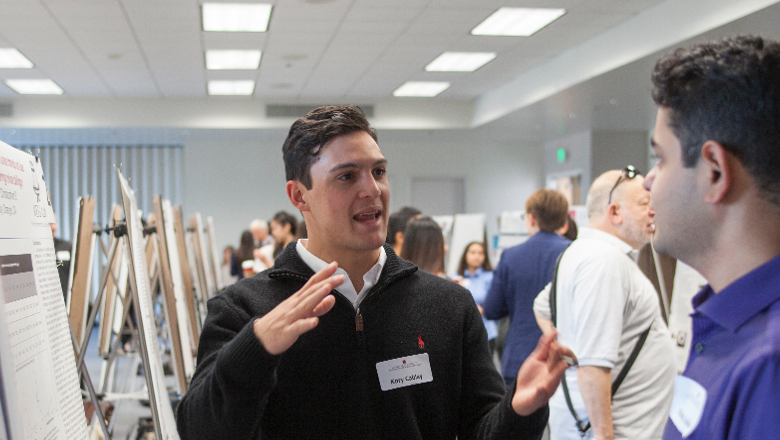 This Semiannual Celebration highlights the breadth and depth of scholarly research and creative activity conducted by Chapman undergraduate and graduate students. 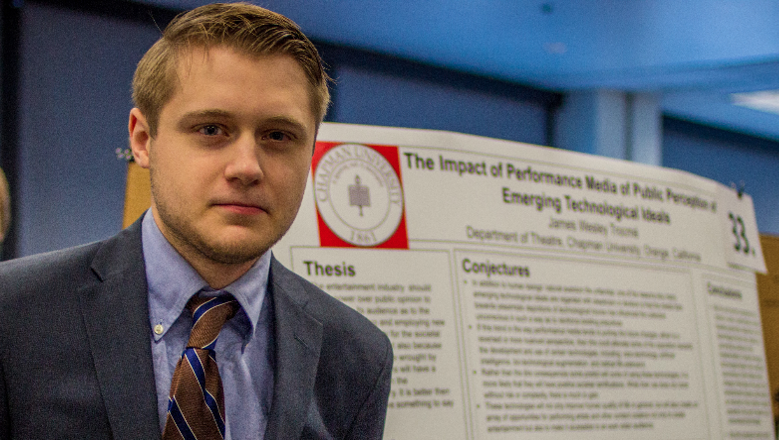 The Student Scholar Symposium is a truly exciting day to learn about, explore and appreciate the efforts that students and faculty have put into a wide variety of research and creative activity projects across campus. This year we are excited to announce the expansion of the symposium with oral presentations and Visual Art Presentations, allowing more opportunities for students to showcase their scholarly work. Abstract submission deadline – Sunday, March 31 at 11:59 p.m.
All participants receive a copy of the Abstract Volume. 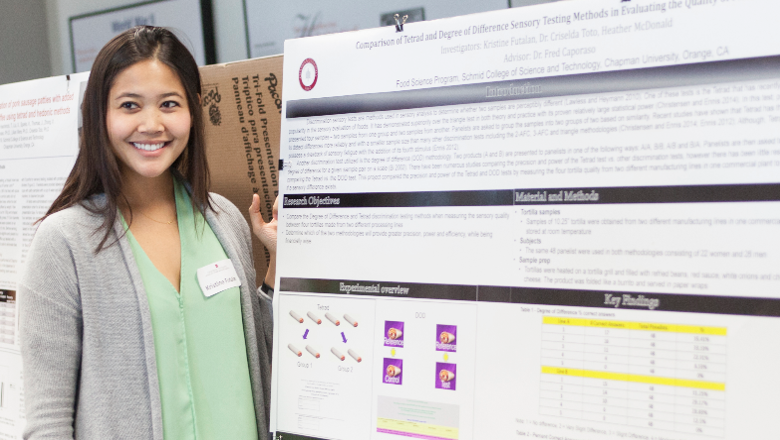 Present your research/creative activity in a poster format to fellow students, faculty, and community members. All students presenting and their faculty mentors are invited to attend the dinner (spring) and keynote. April 15th - Poster Design and Presentation Workshop - Learn how to grab the attention of your audience through layout, text, and images. Get tips on how to talk about your project and engage your audience. Clearly state the central research question and/or purpose of the project. Provide brief, relevant scholarly or research context that demonstrates how the project makes a contribution to the area of inquiry. Provide a brief description of the research or creative methodology. State expected results and/or conclusions. Include text only (no images or graphics). Be well-written and well-organized. Abstracts should run 200-300 words with no paragraph breaks. Maximum length: 2100 characters (approximately 300 words). Use plain text format for your abstract. The form will not process some formatting and special characters (e.g., scientific symbols). References are allowed but not required. All oral presentations will be located in Argyros Forum 209 A, B, or C.
Each session is one hour in length with three presenters. Time limits are strictly enforced by the moderator. Presenters are required to arrive at least 20 minutes prior to the start of assigned session to verify their presentation will display properly. Personal devices are not allowed without prior approval from CUE at least two weeks prior to the symposium. You may store your materials using an external storage device (e.g., a USB thumbdrive) or a cloud solution (e.g., Dropbox, Google Drive) that you can then display with the provided equipment. This symposium provides a setting for attendees to observe and learn conference etiquette. Presenters are required to remain in the room until completion of the session. Artwork will be displayed at the Argyros Forum Student Union Gallery. Accompanying oral presentations will take place at Argyros Student Union Stage. Visual Arts presenters are required to give an oral presentation on their work and process. Oral presentations are limited to 20 minutes per presenter. All poster presentations will take place in Sandhu Conference Center. Presenters are required to arrive at least 20 minutes early to check-in and set up at assigned presentation location. Poster printing is available through CUE. See Poster Printing Guidelines drop down for specific details and deadlines. This symposium provides a setting for attendees to observe and learn conference etiquette. Presenters are expected to be available at their posters for the entire session to present and engage with session attendees. Upon receiving an abstract submission, we will immediately send an email with your assigned online portal link to upload your poster for printing. If you do not receive this email, contact CUE for this information. Upload your poster in PDF format only (not PowerPoint) with the file name "lastname.pdf". Posters must be uploaded by Wednesday, April 24 at 11:59pm for printing. Only one poster per abstract will be printed. Standard Size: 48" x 36'' landscape version (see template). Minimize exotic fonts/symbols which may complicate printing. Double check all spelling, punctuation, and content before uploading poster. 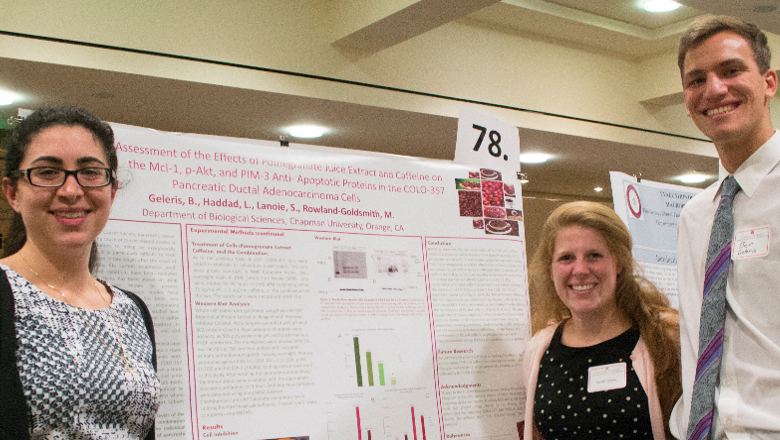 You will be contacted to pick up your poster once printed and are responsible for bringing it to your poster session. Your poster will not be printed if all above formatting requirements are not met. 2018: Anissa Hassouna, Member of Egyptian Parliament, Frist woman elected to the Board of the Egyptian Council for Foreign Affairs and Author of Without a Prior Notice. Watch Anissa Hassouna's Keynote! 2017: Carolyn Forche, Award-winning Poet of Witness, Human Rights Advocate, Chapman University Presidential Fellows, Director of Center for Poetics and Social Practice at Georgetown University. Watch Carolyn Forche's Keynote! 2017: Mike Paul Hughes, NASA Engineer, Music Producer, Composer, Writer, Inspirational Speaker. Deputy Project Manager, ASPIRE, NASA Jet Propulsion Lab and Researcher in Advanced Mars Entry, Descent and Landing Systems. Watch Mike Paul Hughes' Keynote! 2016: Nancy Perloff, Ph. D., Curator of Modern and Contemporary Collections for the Getty Research Institute. As a trained musicologist and art historian, scholarly research and creative activity have played an integral role in Perloff’s life and career. Watch Nancy Perloff's Keynote! 2016: Robert Akscyn, Founder and President of Knowledge Systems, Hypertext pioneer, First Chair of SIGLINK, ACM’s special Interest Group on Hypertext and the Web, honored by field colleagues via “Akscyn’s Law,” former Chairman of the Board for 4 high-technologies companies. Watch Robert Akscyn's Keynote! 2015: Kenneth E. Phillips, Ph.D., Curator for Aerospace Science at the California Science Center, Caretake of Space Shuttle Endeavor. Watch Kenneth E. Phillips' Keynote! 2015: M.G. Lord, Cultural critic, investigative journalist, and comedian. Author of The Accidental Feminist, Astro Turf, and Forever Barbie. Former Newsday editorial cartoonist. 2014: Akin C. Ceylan, COO Home Entertainment, Lionsgate. Chapman University Alumnus, Class of 1990, Chapman Alumni Association Board, VP Communications. 2014: Jennifer Backhaus, Founder and Artistic Director of Backhausdance, OC award-winning contemporary dance company. One of OC Metro's "40 Under 40" in 2009. Alumna of the year, Chapman University. Teaching Artist for the Segerstrom Center for the Arts' community education program. 2013: Robert Diaz, Corporate Transactional Attorney, Finlayson Williams Toffer Roosevelt & Lilly LLP., Chapman University Alumnus, Class of 1997. 2012: Dr. Arthur Benjamin, Professor of Mathematics, Harvey Mudd College and Magician.